Buy A Wholesale Table Skirt and Throws Online Today! Hundreds of Products For Sale in Our E-Catalogue! This Table Skirt is In Stock and Ready to Ship! 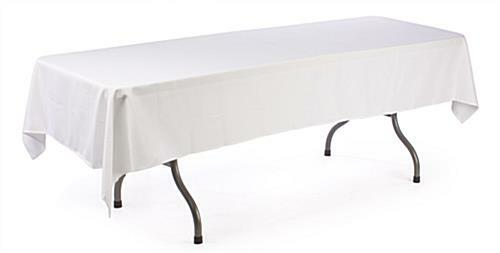 8-foot-long tablecloths cover the top of a 6-foot table entirely. 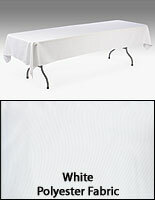 Beautiful white polyester fabric makes any tabletop display stand out. Simple design is easy to set up, maintain & reuse. 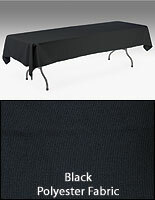 This tablecloth is 8 feet long and fits nicely on a 6' long table. When in place, the tablecloth drapes about 1' on each side of the table. For a full-length draping, we recommend using a table skirt. The table linens, tablecloths for wedding and banquet facilities, sit flat on the surface of the table as there is no extra fabric that could cause bunching or wrinkling on the table's surface. A banquet tablecloth, much like a table skirt, is a low-cost method of creating a sophisticated upscale look to any professional gathering. Often used at wedding receptions, birthday parties, and holiday events, this affordable table skirt for sale is the perfect choice for every catering service or special event venue. Don't spend that extra cash to rent your table skirt or tablecloths! These discount throws are perfect for every banquet function! 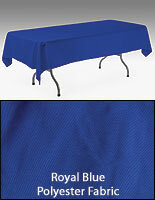 When used with a table skirt, this special occasion tablecloth hides a well-used table from top to bottom. 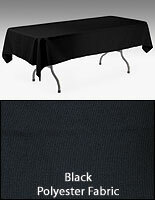 The table covers, tablecloths are fabricated with 100% polyester, which is a durable fabric that will last through years of use.  Our company offers these banquet throws in white, making them the ideal piece to use with contrasting table skirting or runners. For both casual and upscale settings, these tablecloths are perfect for every occasion at any venue. These wedding tablecloths, also called table skirt supplies, are the perfect choice for busy caterers and banquet hall managers that hold both indoor and outdoor events. We recommend the purchase of multiple tablecloths to ensure a unified appearance throughout a banquet facility.